Inspired by the deep web, a little known phenomenon of our vast internet world, the Lafaille Fall/Winter 2014 collection defies convention with its dark and ambiguous design aesthetic. In creating this vivid line of menswear, the collection's designer explored the dark and hidden aspects of today's internet world that served as the main visual inspiration for his structured streetwear garments. From a vivid contrast of red and black garments to an array of sharply studded choker accessories, the Lafaille Fall/Winter 2014 collection takes on a punk rock aesthetic that reveals hidden messages. 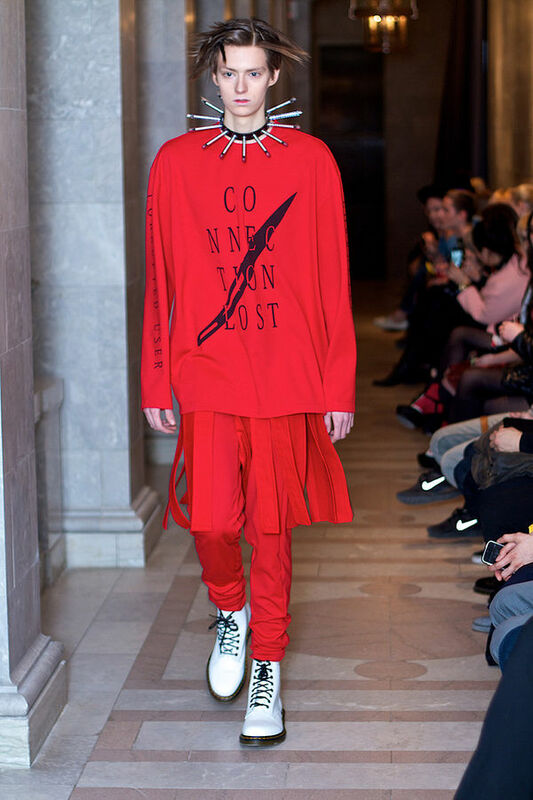 Some of the phrases that can be seen in this conceptual collection include the slogans "Connection Lost" and "Torrent Injection" that are cleverly displayed on athletic sweaters and statement tees.